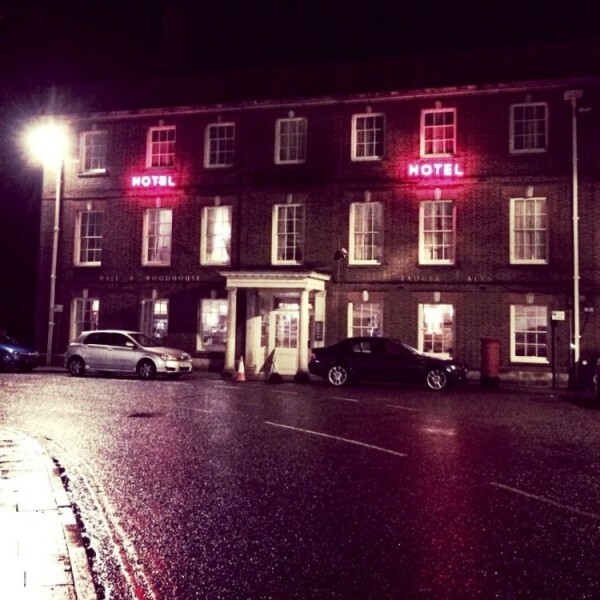 I booked this hotel about 4 hours before I walked through the front door, having deliberated for ages about where to stay when visiting Tottenham. If the truth be known, there’s not a huge amount of viable options in the area, and I wasn’t completely thrilled at the prospect of spending 3 nights in a Holiday Inn Express. What swung it was the free WiFi, ample free parking and free breakfast, on top of an average room rate which was cheaper than a Premier Inn. Premier Inn incidentally charge extra for all of those features, which begins to add up when staying 3 nights! My second visit in October was a little more expensive, which began to erode my view of this brand being a more cost effective option. Check in was very good and within a few minutes of settling in to my room, reception called to enquire how everything was. The room was spacious and clean. 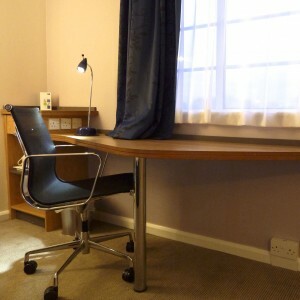 It had a generous work area with plenty of power sockets, good lighting and operators chair. The bathroom, (lacking a bath) was small and despite leaving housekeeping a note, one of the lights wasn’t working throughout my stay. Despite proudly offering free wifi throughout the hotel, (which requires a full A4 sheet of log-in instructions), the free wifi is barely functional. My Speedtest results showed an average download speed of just 0.42 mbps, which they describe as ‘browsing speed’, I describe it as not worth the hassle of logging onto, your 3G phone signal is miles better. When I offered some feedback on this, I was kindly offered one nights free upgrade to the chargeable wifi option. This provides a 4.89 mbps service, which is £5 per 24 hours. I haven’t stayed in a Holiday Inn (IHG Hotels Group) hotel for a little while, so it could be this, or me simply not spotting the clause on the confirmation email before, but I never knew of the latest ‘hotel tax’ that some appear now to levy. If you book more than one night in a Holiday Inn Express (IHG Hotel Group), and once checked in, choose to leave sooner, you will be charged a £50 “Early Departure Fee”. This is an unwelcome fee in my opinion, it will make me think twice before booking one of their hotels for more than one night, as my business diary can alter quite easily. Just to clarify though, this will only feature once you have checked in, so if you book and need to alter your booking before you arrive, this will not be charged. The car park resembled that of a White Van Convention as it seems these were the preferred wheels of a large proportion of the hotel’s guests. Located right next to a large Sainsbury’s supermarket, if you choose not to eat in the hotel restaurant, you don’t have far to walk to buy something to take back to your room. What is not close-by though are any London Underground stations, so unless you want to drive to one, this hotel is hardly best placed for commuting into the city. The view from my room reminded me of the “Hanging Gardens of Babylon” quote from Fawlty Towers, as the main feature being a huge electricity pylon – the going rate I guess from a city location. Comfort-wise, I have three observations. Firstly, the mattress needed chucking away, it was lumpy and about as comfortable as a fall down a flight of concrete stairs. It also had no protector on it, the sheet was simply directly over the mattress, which isn’t ideal. I did report the sad death of the mattress to reception when I checked out, and apparently “Housekeeping will look into it”. I just hope for the next person’s benefit, they look a little deeper into it than they did the faulty light in the bathroom. Secondly, although there was an Air Conditioning Unit in the room, no matter how I fiddled, the result left me either roasting hot or freezing cold. I was unable to stabilise the room temperature, which was somewhat annoying. Finally, other than the office type chair, there were no other seating options, which left only the bed to relax on. From this experience, would I be more or less likely to book another HIE? I’m not sure is the answer, leaning towards a probable yes. With chains like this and Premier Inn for example, it’s easy to criticise and bemoan the lack of this and that, but they do what they do quite well. It’s a no frills experience, much like that of a low-cost airline, but especially for just one or two nights perhaps, they have to be considered a serious option. All that HIE do miss is the 100% satisfaction guarantee, offered by Premier Inn. However, they do guarantee that your HIE-online booking will, at least be the same price as you can find elsewhere online, or the cost of your first night will be refunded. (Maybe worth a few minutes of online research to test this)? My second visit in October 2014 was marred slightly by the distinct smell of urine on the wet toilet floor which prompted a prompt room swap, and by the stained bed linen. Other than these indiscretions, everything, (including the dreadful free WiFi) remained the same. No matter how much they charge there should be no excuse for stained laundry or urine soaked floors. Three stars might be over gilding this particular Lilly, but as I don’t summarise with half stars, it just scrapes a 3. Why not share with me your experiences here… add your comment below. Free & Rubbish here too.